Some of us women show well before the thirty week mark, while others of us don’t show until we are nearing our due date. One thing I can assure you, is by the last few weeks of your pregnancy, the majority of your clothes will not even go close to fitting you. You are tired, hot, cold, sick and ready for your baby to make his or her appearance. This guide will help you style your bump, while still ensuring comfort is the number one priority. 1 Let’s Talk about Undies! There is nothing worse then having undies that dig into the lower part of your abdomen while being pregnant. I was gifted some maternity undies early in my pregnancy which turned out to be a blessing. The Bonds undies, like other maternity undies are soft, stretchable and full coverage. Maternity undies will not only provide you with comfort for the entirety of your pregnancy, but will also help you with the six weeks or more postpartum troubles. Unlike celebrities, us everyday mums would much rather comfort over a fashion statement. Although up until a certain period, heels can be worn without any trouble, heading into the last trimester comfort should be a priority. I invested in a flat pair of joggers while I was pregnant. They gave my feet the support I needed which allowed me to be still out shopping three days overdue. Prior to my pregnancy I would never even touch a stretch dress but towards the thirty week mark I picked up a cheap $10 stretch dress and basically lived in it the rest of my pregnancy. The best part about a simple stretch dress is that it can be dressed up or down for any occasion. Long tight fitting dresses in block colors allow you to make the bump the focus of your outfit. I found long dress worked well, because my bump was quite out-front I did not have to worry about bending over. You can easy dress an outfit up by adding large statement jewellery pieces or a patterned scarf during the winter months. This will depend on which season you spend your last few months pregnant in, although throughout my pregnancy I found myself grabbing my tights day in day out. Black leggings can be match with tight or loose fitting tops and then dressed up with accessories. High-waisted leggings will even give your bump that little bit of extra support during your pregnancy. After you have your bundle of joy, many of us women find comfort in stretch clothes that are comfortable and don’t add extra pressure to the c-section scar or the ‘down there’ area. I personally do not recommend purchasing expensive maternity wear unless you intend on breastfeeding for extended periods of time. Maternity wear can range from one hundred to a few hundred dollars and often women will wear these clothes for less then a year before selling them for less then half of the initial expense. If you wish to buy maternity wear for breastfeeding, I recommend keeping it simple. A basic maternity singlet top can be matched with an array of loose fitting skirts and dressed up or down. If you are heading into your last trimester during the winter months, a singlet can be worn under a loose jacket or jumper. If you don’t normally wear singlets, a loose fitted top with a maternity bra will also serve for breast feeding purposes. If you want to have a little fun while being pregnant, why not purchase a pregnancy related shirt. Although you will most likely only wear this shirt throughout your pregnancy, you can then have it as a keepsake forever. 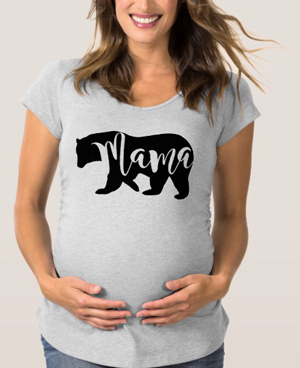 You can purchase shirts with puns or simple quotes about pregnancy. You are only pregnant for such a short period, you may as well embrace it why you can. Blake Lively not only wowed us once but twice with her beautiful bumps. In the following image she has opted to embrace her bump with a tight fitting long black dress with bold accessories. The oversized earrings and bangles add a touch of femininity to her basic black dress. Kim Kardashian shone in white throughout her first and second pregnancy. This long, tight dress along with simple accessories shows it doesn’t take much to dress your bump up. This image shows how you can easily make your bump the centre of your outfit. Heidi Klum wearing a long black statement dress and drop earrings shows just how beautiful she was pregnant. Heidi proves that even large out-front bumps can easily be styled. Kate Hudson showing how a simple soft colour can look amazing while pregnant. Kate shows how you can wear a flowing dress while still showing your bump. Layer your bump- a tight dress, statement jewellery and a denim jacket. Splurge on accessories, not on clothes. Remind yourself, that your body will fluctuate throughout your pregnancy and even for a few months post birth.